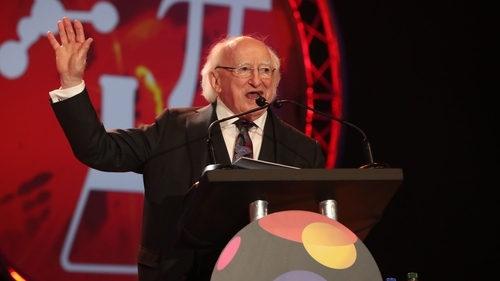 President Michael D Higgins has officially opened this year’s BT Young Scientist Exhibition at the RDS, telling participants it is a wonderful but responsible time to be a young scientist. In a passionate speech to hundreds of students, judges, diplomats, teachers and industry leaders, President Higgins said many of the projects on show are of immense value in dealing with some things that will not wait to be challenged or wait for resolution. These include rural depopulation, regional differences in wealth income and participation, and global challenges such as sustainable development, responding to climate change and migration. He told the young people that they are at a greater degree of ethical awareness than any other generation. What we are witnessing, he told them, is our planet being put at risk by badly thought out policies that we often have not had the courage to correct or face. "The challenges that are now facing us and that I hope you will engage with, they will require the best of our efforts," he said. "New thought, new teaching, new sharing of science and technology." He said young people inspired with enthusiasm, working collectively on a scientific endeavour is what gives us all hope. "We must free up the benefits of science and technology for where they are most necessary," he said. Also addressing the opening ceremony, Managing Director of BT in Ireland Shay Walsh said the participants were part of an elite group of only around 70,000 people who had ever taken part in the exhibition. He also said they were making history as the exhibition was the longest running STEM event of its kind anywhere in the world. The overall winner will take home the coveted title and trophy, but also a cheque for €7,500 and a trip to Bletchley Park. They will also get an opportunity to represent Ireland at the 30th EU Contest for Young Scientists. The public can visit the exhibition from tomorrow through to Saturday and as well as viewing the projects, there will be 20 shows per day for visitors to enjoy, as well as the RDS Primary Science Fair. More than 1,100 students will showcase 550 projects during the four-day event, with the overall winner due to be announced on Friday evening. Now in its 54th year, the BT Young Scientist and Technology Exhibition began life as a science fair set up by Dr Tony Scott and the late Fr Tom Burke in the early 1960s. Since then, it has grown into one of the largest and best known student science exhibitions across Europe. A total of 2,031 projects were entered into this year's exhibition and the best 550 have been chosen to present their work. They will also compete to take home one of the more than 100 prizes on offer.